I am trying my hardest to hold on to my flip flops as it starts to get colder. While I am still wearing them often, it hasn’t been possible everyday. That is okay though because I have found a new love. My new Kigo Drive shoes. A minimalist shoe that is the next best thing to being barefoot. Wear them with or without socks. You may not want to take them off! These super stretchy eco-shoes are made with completely recyclable CyclePET uppers and HD Plus insoles and outsole. They are water repellent and probably the lightest pair of shoes you’ve ever owned. This is nice because you don’t feel bad about taking them along on a trip or store in the car, as they can easily be tucked anywhere. I love the slip on feature. No need to tie as they fit snuggly around your foot. 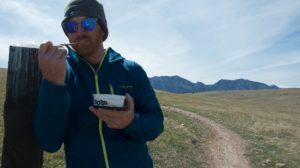 Kigo footwear is 100% virtual company to help with their carbon footprint which means you they use no paper, work remotely through email and video conferencing and avoid travel when possible. You can find them in online stores like Planet Shoes and a few outside boutiques. They have been certified by the Green America’s Green Business Network as an environmentally and socially responsible business. Check out their Cradle to Cradle philosophy and their Recycle Reuse Rewards program. 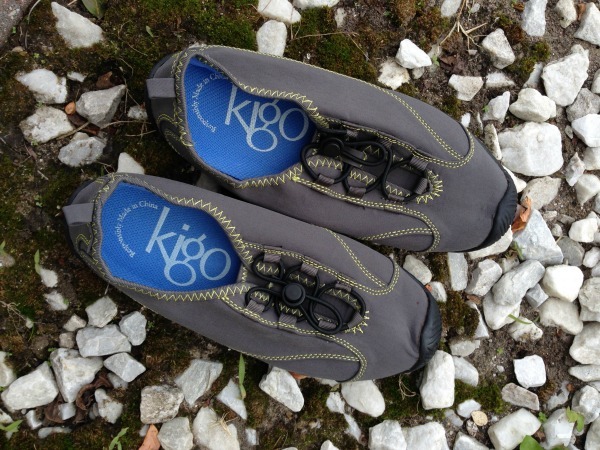 You need a pair of Kigo shoes to live in too! Now to keep my toes warm indoors I just slip on my Giesswein Slippers. Boy are our hardwood and ceramic floors cold at 6am. I need these slippers! Are you in love with the hand stitched appliqué like I am? The owl and fall leaves are toooo cute! These slippers are made from 100% natural boiled wool. Even the natural rubber and recycled carbon footbed are covered in the wool. This ensures your foot will be dry and comfortable and you won’t overheat! Arch support and cushion in a slipper? yes! You can wear them all day long around your house. They are also removable allowing you to replace them with a custom support if you need to. The rubber outsole has also been dipped in natural latex (a process patented by Giesswein) and provides both traction control and durability. I feel good about wearing them outside my house a bit to get the mail or check on the boys. I don’t think I’ve ever seen a better slipper! Comfy and cozy. Geisswein Slippers average around $104 depending on the style. They have some GREAT styles with unique appliques. Be sure to check them out! Always Free Shipping when you spend $49 and Free Returns. Sign up for their Newsletter towards the bottom of their site to stay up to date on sales AND be sure to enter their Weekly Giveaways! WIN a pair of Geisswein Slippers of choice! I received these items for free for review and all opinions are my own. This giveaway will end on November 26, 2013 at midnight EST. Winners will be drawn via rafflecopter. Once a winner is drawn I will contact them and they will have 48 hours to reply before I draw a new winner. Giveaway is open to anyone in US and you must be 18 years of age or older. Giveaway not affiliated with Facebook & I release them of liability. Winner will be posted in the rafflecopter widget. I like the bearpaw Emma for toddlers. They look really warm. I like that they offer free shipping over $49. These would be so nice to have.I love a pair of shoes that I can slip on and go. I usually have Plain Jane slippers but the Giesswein Stams are sure cute! I love http://www.planetshoes.com/item/giesswein-veitsch/37035/zr9 they look so comfy! gosh. Do I really *need* another pair of comfy shoes? Well, yes...yes I do! Thanks for this one! and the removable arch support is genius! http://www.planetshoes.com/item/giesswein-veitsch/37035/g50 These slip ons are really nice! Wish I could just click & buy :o) but...can't. I love these, they look really warm and comfortable, my favorite slippers are the Giesswein Veitsch in schiefer! After looking at their EXTENSIVE site, I found the cutest and warmest looking slippers called Acorn Sheepskin Moxie Boot (in raspberry). Love them! Those look like amazingly comfortable slippers. Our house is so cold in the mornings, these would be awesome! These look so comfortable! I love the Giesswein Veitsch. I love the Giesswein Slippers. Their embelishments on their slippers are awesome.. I favor the all red ones with the embellishment on them.. They are called Giesswein Horn..
Oh man,these are so cool! I love the Stams! They are just my style and so cute! What awesome gifts these would make too! These slippers are just over the top cute! I love them. Very unique looking. I think I'm in love - can you be in love with a slipper??? I like the Giesswein Graz slippers. I love the Giesswein Slippers. Giesswein Vent in ocean looks great. Thanks for the contest. i really like the boots Earth Redwood, they are the perfect height and i love the color. they have so many to choose from, it is so hard to pick which one i want first,lol. i love the blowfish tuga shoes as well, i really really like those. I love the lunz style slippers, they are too cute and look really comfy! I love the Giesswein Veitsch. i love the Stams! they are so pretty! I like the Giesswein Steeg in Black. Thank you! I love all the slippers! I am house shoe crazy. I really love the Giesswein Gerolding in brown! I love the Giesswein Hartburg slippers! I love the Giesswein Vienna. These look great- my fave pair are the Giesswein Vent-Item Code: 37033-ZR9-E38. Those slippers you have posted are to die for! I would wear them in public!! Thank you for the giveaway! I would love these! I love the Giesswein Gastein black! They look like black cheetah print! I love these, they are ALL so cute - esp. these: http://www.planetshoes.com/item/giesswein-lunz/37041/171 / Great review, thanks for the chance! I like the Andau slippers. they are all so cute. I love the "Vienna" and "Horn"
I am loving the woman boots called the Bo BLow fish Rggie in the dark brown fawn! They are vegan! The slippers are outta sight! I absolutely love owls and would adore having these beautiful slippers to pat about our cabin in during the long, cold Vermont winters! Thanks for the great giveaway! Fingers crossed! I love the Giesswein Lunz slippers. Absolutely love the slippers! They look so comfy cozy! I like many of the items I have just looked into. However, the one I like the most is the Merrell Snowbound Mid waterproof Boot for women. It fits my needs for the winter here in the northeast to a tee. I love the Owl with the Fall leaves...it's just my style. Giesswein Gastein -- just beautiful!! I love the style! Wish they had my size in the clearance styles! I do love those slippers and they get such great reviews - love the Vienna! I love the Giesswein Feld slippers. I thought it was interested that they're made in Slovakia. I would love the Giesswein Lunz ones, they look so warm and comfy. I realy love the owl slippers ! I just love the Giesswein Lunz...sadly cannot afford them...but I love them! I would be happy with any of them, but I love the color of the Horn slippers. I am in love with the appliques!! They look so comfy! I tend to wear my flip flops year-round. I can get away with it, being in California! I like the Giesswein Gastein slipper in black. I like the Giesswein Vent! These are too cure especially the Giesswein Hartburg slippers at Planet. Thanks for the giveaway. I like the Giesswein Stams. I like the slippers you have pictured aswell as the vent style. OMG I LOVE THOSE SLIPPERS! how adorable! I love the Stams and Steeg designs. I wear slippers all the time in the winter; I would love these. OH I love them ..........too many to choose from would be a hard choice. They are this cute AND comfy? Too good to be true! I can't stand how cute these slippers are! I live in my slippers & I would love new ones! These would be a treat for my feet on our cold, Chicago mornings! These slippers are awesome! I really love the Giesswein Lunz in Charcoal. My favorite slipper is the Giesswein Veitsch. They look so comfortable, yet are very durable. I really could use a new pair of slippers to wear this winter, mine are pretty old. I love the simplicity of the Giesswein Stams. I adore them all, especially the Giesswein Feld! I loooove the Giesswein Lunz! They would be amazing on the snowy days we get here in Mammoth Lakes, CA! Oh these slippers look so nice! I love all the different prints and colors they have! I really love the Giesswein Hartburg! Wow - who knew you could get such cool slippers? The Giesswein Vent are nice. I am crazy about the Geisswein Vienna slippers. Cute! They do have some awesome slippers! The Giesswein Hartburg are my favorite! They are the cutest slippers! I like that have so much support too. My favorite are the Giesswein Lunz in Charcoal. ooh i really like the Giesswein Innsbruck and the Giesswein Feld in natural! so pretty! Giesswein Ammern are really cute. I really like the Giesswein Veitsch. I also like that they are machine washable. I love the little owl slippers. I love Planet shoes - and I immediately fell for the Blowfish Bilocate boot and the http://www.planetshoes.com/item/fly-london-yava/24012/609 - in Bordeaux I also love the Gusswein Vienna Slippers! I like the look of the Giesswein Steeg in Black. I love socks, and they have a ton to choose from! I'd be very happy picking out several pairs from there! Thank you for the giveaway!! I like the Giesswein Vent slippers. These slippers from Giesswein are wonderful. I really like the natural colored Giesswein Feld slippers with the bird design. I love the Bezau! They are so cute. My husband would love the Giesswein Steeg slippers. 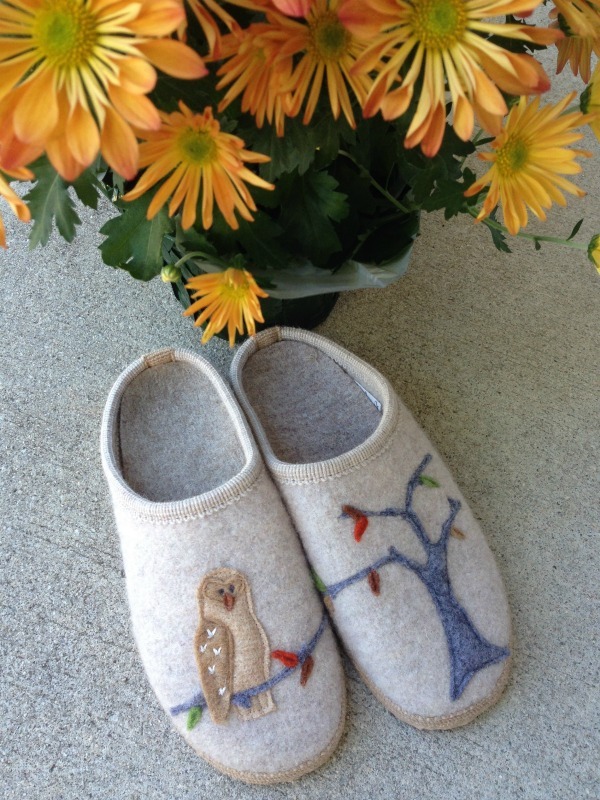 I love the Bezau slipper, but the Owl one you featured is to die for as well! That would be a tough choice if I had to choose! I like the Giesswein Vienna Slippers. aw man i REALLY want these!! Giesswein Bezau is my fave.. Very cute. I like Lunz. I really love the Gentle Souls Two For Dawn! I am in love with the owl slippers in your post. I love those slippers and I bet they would be nice and warm. Thanks. Though sad it wasn't me...CONGRATS to the winner!